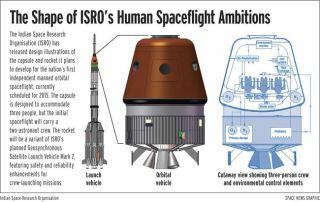 This graphic depicts the India Space Research Organisation's plans for the nation's first crew-carrying spacecraft. The Indian Space Research Organization (ISRO) will receive57.78 billion rupees ($1.25 billion) for 2010 — a 38 percent increase over lastyear — under the budget approved Feb. 26 by India's Parliament. The bulk of the funding,some 21 billion rupees, will go to launch vehicle technology development, whilesatellite technology development will receive 10 billion rupees, a 45 percentincrease over the 2009 level. ISRO's mannedspace program will receive 1.4 billion rupees for the new budget year,which begins April 1, to continue development of a space vehicle designed tocarry two astronauts to a 250-mile (400-kilometer) orbit and return them safelyto Earth, according to ISRO documents. ISRO spokesman S. Satish said Feb. 26 that the money willpermit the space agency to begin preliminary research and developmentactivities leading to detailed definition of the manned mission. • 2.5 billion rupees for continued development of aso-called semi-cryogenic rocket that will use kerosene fuel. • 1 billion rupees for Chandraayan-2, a follow-on to India'srecently completed lunarorbiter mission that will be conducted jointly with Russia. • Continued funding for Aditya, a sun-observing satelliteslated for launch in 2012 and billed as India's first space-based solarcoronagraph.